DENVER (Reuters) - Negotiators for striking Denver teachers and the city school district returned to the bargaining table on Wednesday after a productive session the previous day, as the walkout affecting 92,000 students entered a third day. The two sides sounded an optimistic note on Tuesday after resuming talks that had broken off on Saturday, and went late into the night seeking to resolve differences over a variable pay system, known as ProComp, which has been at the center of the dispute. "We exchanged proposals that are moving us closer and are hopeful that we will get to an agreement soon," union President Henry Roman and schools Superintendent Susana Cordova said in a joint statement late on Tuesday. "However, we need a little more time to resolve the outstanding issues," they said. 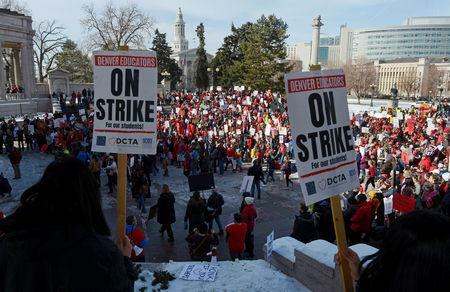 The Denver Public Schools district said all of its 207 schools would hold classes on Wednesday, except pre-kindergarten, staffed by substitute teachers and administrators, as they have since the strike began. On the picket lines, some teachers said the progress reported after yesterday's session gave them reason for optimism. Cal Hossman, 56, a special education teacher at North High School, said he knows Roman and chief union negotiator Robert Gould personally, and does not believe they would have signed on to the joint statement if they did not believe progress was being made. “I think the strike has put pressure on the district to come closer to our position," said Hossman, who has been teaching in the district for 16 years and said he delivers pizza on weekends to augment his salary. Claiming that many teachers are leaving Denver because their pay increases have failed to keep pace with the city's cost of living, the union has been pressing for a salary structure focused less on bonuses under ProComp, or Professional Compensation, and more on general wage increases. The union embraced the ProComp variable pay system as a way for teachers to build their salaries through a mix of possible incentives when it was instituted in 2005. But it now blames ProComp for eroding teacher pay in a city where the cost of living has soared in the past 10 years.